If you are looking for a groovy bundt cake from the 70’s, today is your lucky day. I found this in an old Pillsbury cake booklet, and it’s awesome. 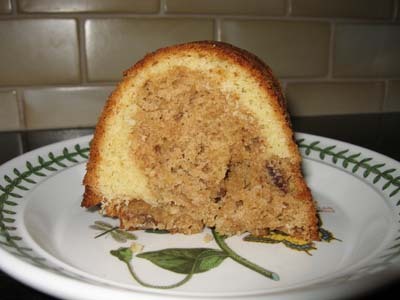 “Cinnamon Crown Cake” is a moist yellow cake with a big ring of cinnamon-nut cake running through the center. Aside from being pretty and tasty, it’s simple. You don’t need any fancy equipment, just a hand held mixer. If you happen to have a kitchen scale it will come in handy because you can weigh out the flour, but you can make it without the scale as well. Just be careful not to use too heavy a cup of flour, which is one major reason some cakes turn out dry. This is one I’ll be making quite often now that I’ve finally tried it. In fact, next time I make it I’m going to put on a Bee Gees album. A few notes. That thing near the bottom on the right side is a pecan. The center is full of nuts and very flavorful. The cake is much moister than it appears here. But don’t take my word for it, just bake it! Cinnamon Crown Cake is an double flavored Bundt cake. Preheat oven to 350 degrees F. Spray a 12 cup bundt pan with flour added baking spray. In a medium bowl, thoroughly stir together flour, baking powder and salt. In a mixing bowl, using a hand held mixer, beat together butter and sugar. Beat in eggs and vanilla and continue beating for 1 minute or until batter is light. Scrape sides of bowl. By hand, stir in flour mixture alternately with milk. Pour half of the batter into pan. I weighed the batter, and half of the batter weighed about 24 ounces. If you have a scale, you can weigh out half the batter and pour the rest in. If not, just estimate. Stir remaining ingredients (pecans, oats, brown sugar, cinnamon and applesauce) into remaining batter in bowl; Spoon into pan so that it sits on top of first batter. this looks wonderful, I am a big fan of cinnamon, its such a versatile spice. Mmmm… this sounds (and looks) so good! I’m gonna try this one. May I know how do you usually measure your flour? Dip and sweep? Or spoon and level?Would you happen to know the weight of 1 cup of flour measured your usual way? Sorry, I’m just more used to baking by weight. Thanks so much. Brenda, let me know what you think.Sharmini, I weighed the flour. I used 13 1/2 ounces.Pumpkinpie, I was thinking a chocolate version would be good too. Specifically, a chocolate/cinnamon tunnel. You could either melt semi-sweet chocolate chips and add them in or just use unsweetened cocoa powder. Another thought was to use a bit of cocoa powder and sub prune puree (prune baby food) for the applesauce. OR you could just make it as is and add a chocolate glaze. That looks so good. I’m definately going to try this. I’m going to parents for the weekend so I may make it to take for snacks. It helps that is has my favorite pecans in it!